Hopefully this unholy terror is also the last of its kind. Come on people, stop buying RGB mousepads before it's too late. 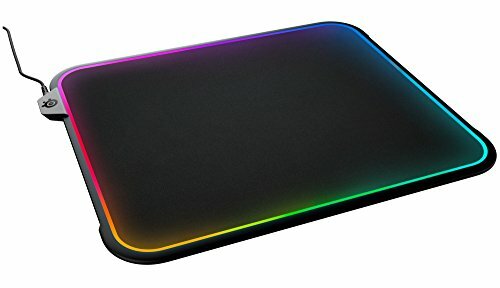 Will you people quit buying RGB-enabled mousepads? First Razer decided the world needed this unholy terror by unleashing the Firefly in 2015. Then Corsair was like "We must forsake the old gods in favor of this new abomination" and put out its own, lesser-named MM800 RGB Polaris mousepad for 2016. For 2017? Apparently SteelSeries has also been convinced that this sin against nature is the next must-own PC peripheral, today announcing the $60 QcK Prism mousepad. SteelSeries's gimmick? "The new mousepad provides gamers with dual-sided premium surfaces—the first of its kind." I don't know quite how the cable works when you flip the QcK Prism over, but it seems like one side of the QcK Prism is the hard plastic seen on the original RGB-laden Razer Firefly and Corsair's $40 MM800, while the other side is the cloth used on the standard QcK and on the $60 Firefly Cloth Edition. If you need both…well, here you go. The QcK's lighting is 12-zone, with integration into SteelSeries's proprietary GameSense SDK for game-specific lighting tricks. I don't know how many people are tied into SteelSeries's system compared to Razer, Logitech, and Corsair, but the potential exists. Also if you have other SteelSeries gear you can sync your lighting between them. And I'll say this: SteelSeries still makes some of the cleanest software for its peripherals. Corsair's software is a labyrinthine nightmare, Logitech and Razer's are serviceable, but SteelSeries Engine is both intuitive and sleek-looking. SteelSeries is selling the QcK Prism for the same $60 suggested price tag as Razer and Corsair's RGB mousepads. With dual surfaces for the same price as other companies are selling a single surface, I guess that makes SteelSeries the best value on paper. Let's be clear, though: None of these are a good value. $60 for a light-up mousepad is just as absurd now as it was when Razer's Firefly launched two years ago, and you will never ever in a million years convince me otherwise. Sure, it looks pretty, but at what cost to your dignity?